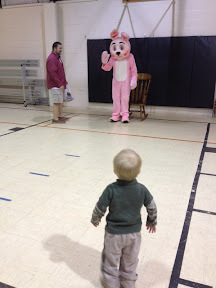 Today was our church's annual Breakfast with the Bunny. We had pancakes, eggs, bacon and sausage along with orange juice and milk. Then came the main event...the Easter Bunny! 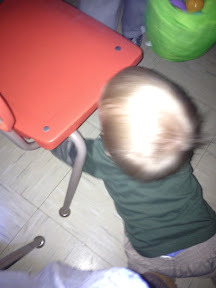 Just like with Santa, Tristan dropped everything as soon as he saw him and made a B-Line to be the first kid. Once we got him off the Easter Bunny's lap, he got out his ring sucker the Bunny gave him and sat to eat it. 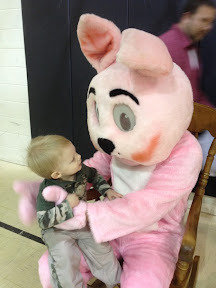 It only took about 10 shots to get one of him looking at me because he wanted to go back to the Bunny's lap! Tristan even went back to the Bunny for a second trip! After all the kids had had time with Peter Cottontail, it was time to get ready for the egg hunt. 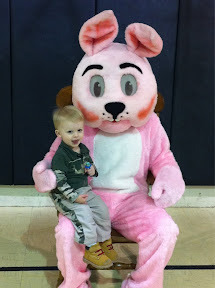 We have a sort of tradition at our church; we hold the egg hunt in the gym, safe from unpredictable spring weather. How do the kids hunt eggs you ask? In the dark of course! We turn out all the lights an give each kid a flashlight, instant difficulty! The kids under 3 have their own area to hunt where they won't get run over. We take all the kids into the hallway where the bathrooms are while adults hide eggs. Finally it was time to actually hunt the eggs. 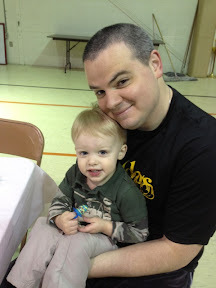 Tristan had a blast! Last year I think he picked up 2 eggs and was finished. This year he was really into it running all over the place getting eggs. Here he's picking up 3 at once! 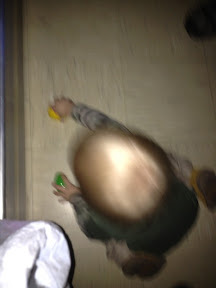 His daddy held the flashlight for him while I took pictures.